Enjoy a relaxing stay just steps from the city's main attractions at Cleveland Marriott Downtown at Key Tower. Our 25-story luxury hotel is located in the heart of the vibrant downtown district, across the street from Huntington Convention Center of Cleveland. 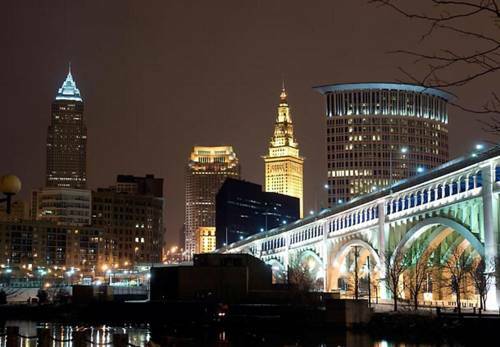 Settle into our spacious, modern hotel rooms or suites with marble bathrooms and plush bedding and soak in the ambiance of downtown Cleveland with views of city landmarks or Lake Erie. Stay relaxed and focused in our state-of-the-art, third-party, 20,000-square-foot Vedas Spa. Join us for delicious Italian cuisine in our newest restaurant. Host your next event in downtown Cleveland in one of our newly redesigned event spaces, many with breathtaking views of Lake Erie. When you're ready to venture out, you'll find that our hotel is just steps from shopping, dining and nightlife, as well as the Rock and Roll Hall of Fame, FirstEnergy Stadium and Quicken Loans Arena. We look forward to welcoming you to our stylish luxury hotel in downtown Cleveland, Ohio. Greatroom: Step into our midwestern modern dining room and know that you've arrived to a relaxing restaurant like none other in downtown Cleveland, Ohio. Savor inventive cocktails and delicious American cuisine, just steps from the convention center. Public Square Pantry: Fuel up for a day of meetings or sightseeing in downtown Cleveland at our pantry. Discover freshly-prepared food for breakfast, lunch or dinner. Grab a coffee and pastry, ack a picnic lunch to go or stock your refrigerator with late-night snacks. Il Venetian: Savor our delicious Italian cuisine served stylishly in a warm and inviting setting at Il Venetian, our new signature hotel restaurant. Open for lunch and dinner, our restaurant is fast becoming one of the most popular dining spots in downtown Cleveland.